Spinal touch treatment can help aid recovery from accidents, injuries or traumas as often these traumas have physically shifted the body out of balance - and these imbalances need to be corrected. 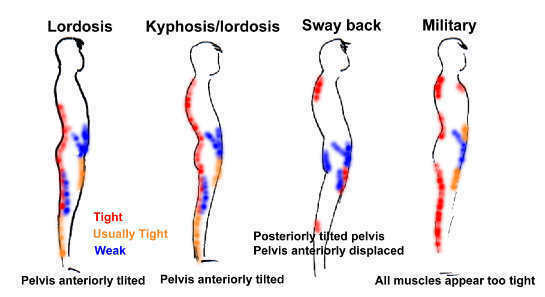 The diagram below shows the negative effect that poor posture can have on the body. The muscles have come under strain trying to hold the body upright - if these postures aren't corrected then problems can occur in the nervous system, spine, shoulders, hips, knees and corresponding muscles. Spinal touch can help to correct these postures and their negative effect on the musclar skeletal system and nervous system. This is the ideal position of the spine - the spine is like a shock absorber for the body helping us to stand upright and bear the weight of our muscles and tissues under the natural forces of gravity. The position of the sacrum or 'sacred bone' (literal Latin translation) is critical to the alignment of the spine as the centre of gravity of the body is located at the point were the 5th lumbar vertbrae and the sacrum meet. Spinal touch focuses on physically correcting any postural imbalance at the centre of gravity and 'reprogramming' the central nervous system to retain the correction so that the ideal posture is maintained.